In the Philippines we can't deny the fact that the best selling skincare products are usually those with whitening effect! Girls just love to be fair skinned nowadays that is why there is a big demand for whitening products which include glutathione. Glutathione can either be taken orally or through gluta IV injectibles. Gluta IV is said to take effect so much faster than oral glutathione but how about if its a sublingual glutathione? Will it be possible for a tablet to replace IV administered Glutathione ? This is the promise of Glutaredox L-Glutathione Sublingual Lozenges offered by Oxina. Oxina is a baby brand that is associated an award-winning online shop has been providing top products for beauty and wellness since 2006. The flagship product that Oxina is currently carrying is called Glutaredox. GLUTAREDOX, a groundbreaking supplement that gives the same effect of a glutathione injection in a simple sublingual tablet. It has a patented formulation containing a high concentration of Reduced Glutathione, Vitamin C, Selenium and L-Cysteine along with its Oro-FS-Release technology assures of 100% absorption rate which makes it superior to others. Given its special formulation and innovative route of administration, Glutaredox Oro-FS-Release ensures maximum bioavailability of reduced glutathione in all areas. Its in a box instead of plastic bottles which made it environmental friendly. Each box comes with 5 aluminum foil blister packs. One blister pack contains 6 tablets so 1 box is good for a month. 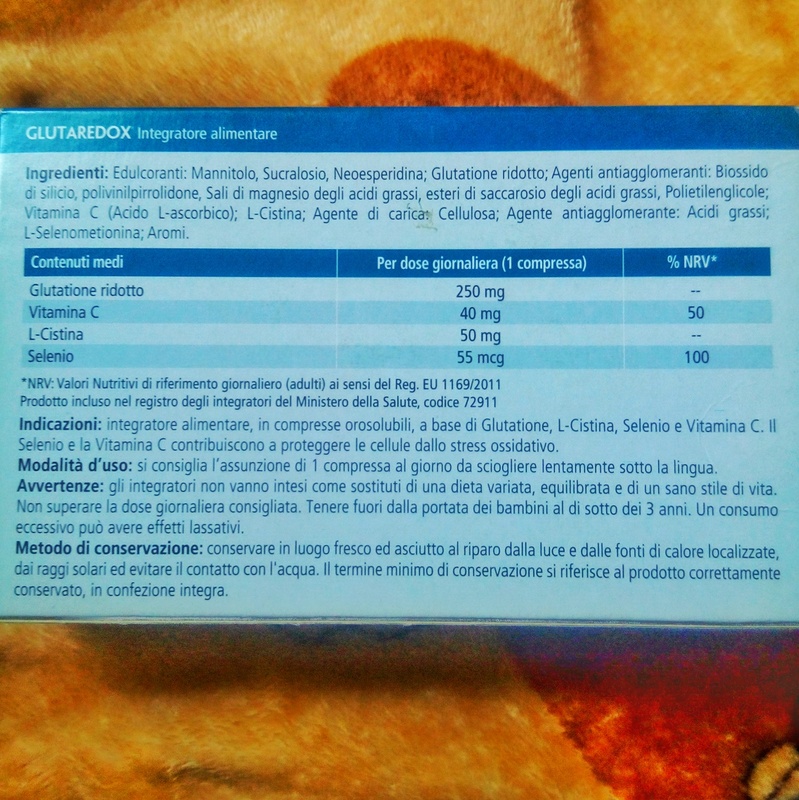 The product is patented in Italy that is why the language on the box is in italian. Hopefully they can provide an english guide and/or ingredient list in the near future. 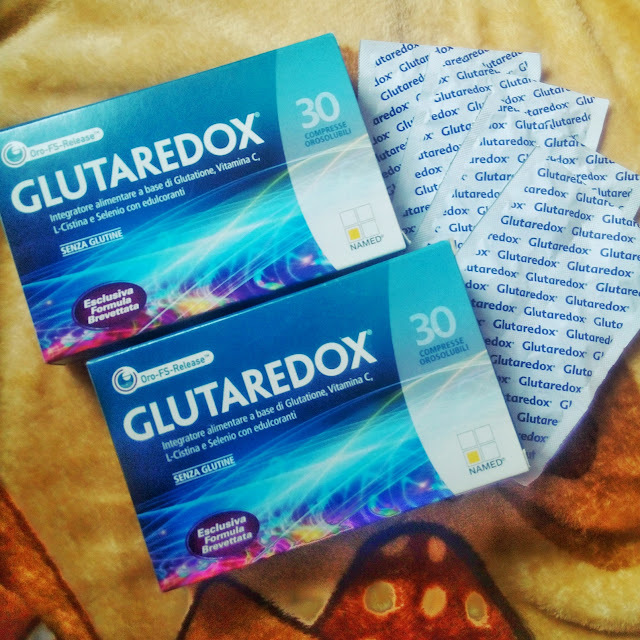 Glutaredox is said to be a hassle free glutathione in tablet form. Well its not really my first time to take glutathione but the ones I've tried are all in capsule form. What sets Glutaredox aside besides being in a tablet form and taken sublingually is the facet that I only need to take just one capsule a day! Just one capsule means its economical and affordable. Good thing that the effect won't suffice because of the sublingual method used which actually means you'll get 100% glutathione absorption because there will be no digestive and excretory barriers. Truth to be told was when I first took Glutaredox I forgot that it should be taken sublingually and I've chew it like Bonamin! I've never tried taking sublingual tablets before but I've read that the tablet should be under the toungue. The sublingual method as well as the formulation allows Glutaredox to immediately take effect and raise the body's glutathione levels in just a matter of hours. I've just finished the 2 months supply and I couldn't be any more satisfied. During my first week of taking it I really felt light and energized. It just felt different to take the tablet under the tongue but I got used to it after a while. I didn't notice the instant effect after just taking one tablet but my skin is finer now and I stopped breaking out easily. I also noticed that my pimple marks is gradually lightened. I can't attest with the anti-aging but the anti-oxidant property is very good. A 30 days supply is only P1800 and you can easily purchase them at Oxina. You can only purchase it online as of now. There is a possibility that I will because I like to detox using Glutathione supplements. For me, Glutaredox L-Glutathione Sublingual Lozenges can be your best bet as an alternative to Gluta IV shots. Give it a go and see how it fares for you. I want to thank the sublingual method for the fast results it gave me and Oxina for letting me try it. I am pleased with the results! Awesome product. Any questions? Let me know if the comments!